Jacob Prior was among the many Rutland area children elated to visit the Grinch. 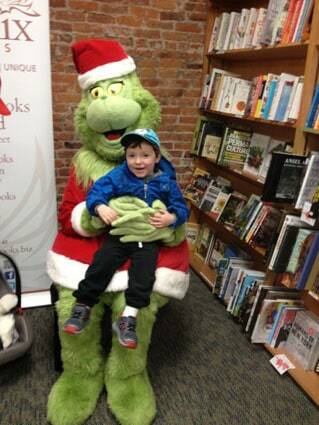 RUTLAND — The Grinch was a popular character at Phoenix Books this past weekend: he attracted about 400 attendees at the Rutland event (and 150-200 in Essex). Attendees in Rutland Saturday, Dec. 5, got to meet the Grinch, take photos with Dr. Seuss’s meanest and greenest creation, and participate in craft projects. The events also launched the annual holiday food drive at Phoenix Books, which will continue through the end of December. Phoenix Books owner Mike DeSanto will match community members’ donations. The Grinch was a huge hit with the younger attendees, according to Kristen Eaton, the marketing and events manager for Phoenix Books. “There’s no one like the Grinch to bring out your holiday spirit and help you grow your heart three sizes!” said Eaton.